An Aberdeen man killed in an RAF drone strike against the so-called Islamic State group had "absolutely no fear of death", a childhood friend has said. Ruhul Amin, 26, died in the Syrian town of Raqqa following the strike. Stephen Marvin said he spoke to Amin on the phone after he went to Syria to ask him why he joined the group. Mr Marvin told the BBC's Good Morning Scotland programe: "He said 'if I die, I'll be with Allah'." Cardiff-born Reyaad Khan, 21, was also killed in the precision strike on 21 August by a remotely-piloted aircraft "after meticulous planning", David Cameron told MPs on Monday. Mr Marvin said: "On the phone he still spoke to me as if he was exactly the same person, as if we were sitting in front of each other speaking. "But you could tell there was something completely different about him. "He said 'no, it was rebel fighters at the other side of a river'. He said 'if I die, I'll be with Allah'. "He said 'two of my brothers died previously and they still had a smile on their face for three days and their body, when it started to decompose, still smelled like roses and that's because Allah is protecting them'." He also said Amin told him: "We only attack people who will attack us. "He assured me there were no plans to come to Scotland, anyway. "It's kind of hard to have sympathy with him. "I wouldn't say the government should be just going over and annihilating each and every one of them, but surely he knew what he was getting into." Muslim leaders in Aberdeen have called on young members of the community to learn lessons from the deaths. Defence Secretary Michael Fallon has said the UK would "not hesitate" to launch more secret drone strikes in Syria to thwart potential terror plots. 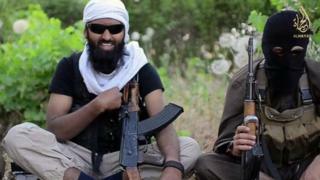 He described the RAF strike which killed the two British jihadists as a "perfectly legal act of self defence". One of the men was planning an attack on a "major event" in the UK, he said. The strike was the first targeted UK drone attack on a British citizen.